It’s true romance meets Mr. and Mrs. Smith meets safe house, and unfortunately the movie ends up being a lot closer to safe house than those other films. 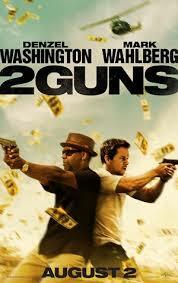 2 Guns is a routine and ordinary movie. it’s basically what has become of the modern buddy action movie, which puts lousy attempts at humor ahead of interesting or creative plot. Mark Wahlberg spoofed this kind of movie with the other guys, but here, he’s making it seriously. The movie is a combination of parts from other films, to the point where these two guys from opposite sides of the law (kind of), have to team up together because everyone else, from all different organizations, is trying to kill them. two guys on the run from everyone. It’s another safe house. There are some interesting moments surrounding the bank robbery, but other than that the movie is pretty flat. 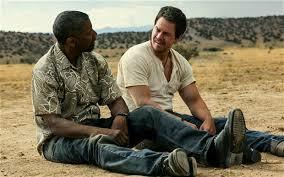 2 Guns is the usual, predictable and uninteresting action movie. It’s the kind of cop-action movie of the last few years that Denzel Washington has found himself pretty glued to. He has become the new Pacing, meaning that he’s in a phase of his career right now where he just wants to work with younger actors in action films. Pacing went through that phase in the nineties, working with Keanu reeves (The Devil’s Advocate), Johnny Deep (Donnie Briscoe), and Colin Farrell (The Recruit), all within a small amount of time. Now it’s Denzel’s turn, having just come off safe house, with Ryan Reynolds, and turning to this film with mark Walberg. The difference is that pacing’s movies were good. They were creative. You can’t look at the devil’s advocate and compare it to anything else, short of rosemary’s baby. The same cannot be said of the movies Denzel Washington is making. 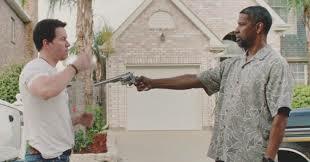 The funny thing about 2 Guns is that in many ways it is meant to be like true romance and there’s a connection behind that. The director here (the Icelandic director behind Walberg’s movie, Contraband) even cited true romance as one of his influences. And the reason why that’s funny is because true romance was a tony scot film, one that scot basically tried to rehash again and again (Enemy Of The State, Domino), and Washington loved working with Tony Scott. The two were a team, making tons of movies together to the point where the movies started getting really bad. Their movies began as great, as they made crimson tide together, (the best of their collaborations.) then it was man on fire and Déjà Vu, two decent movies. Those films weren’t great, but at least they had original ideas. After that, the two went on to make The Taking of Pelham 1,2,3 and unstoppable. These were the worst two. Then Tony Scott committed suicide and Denzel went on to this next phase of his career, the working with younger actors in routine action movies phase. Luckily, Denzel doesn’t only make those movies, and just last year he found a good project to star in. that was flight, directed by the great Robert emesis. It’s all about the original concept. With 2 Guns, however, it’s all about the payday. Clearly this was a fun movie to make, but for the audience, that doesn’t translate to anything new. The film feels like we’ve seen it before, over and over again, and the only thing that saves it is the likeability of the two actors. The storyline here is that these two guys rob banks together. We start out in a scene with them at the diner next to the bank, having a conversation at the table and then setting the place on fire. This is a pretty cool scene; with mark Walberg’s character, stag, throwing his lighter onto the grill after setting off the fire alarm in the restroom. Then we cut back in time to a week earlier. We expect to see something about how these two guys met or how they ended up robbing banks together. No such luck. Instead of that, all we really see is Denzel’s character, bobby, meeting with other people who will lead him to rob this bank. He meets with a guy named papa (Edward jams Olmos), who is the big boss down in Mexico, and runs a bull ranch. Papa and bobby have a deal going where drugs are being exchanged for money, and since papa doesn’t have his end to turn over right now, bobby leaves the ranch with papa owing him. We also see bobby speaking with a fellow officer, dab (played by Paula Patton), about what he has going on with stag, and how they are going to rob this bank. Bobby tells dab to be outside with a ton of police when they come out, after the robbery, and to arrest stag. Following these scenes, we cut back to the diner. While I don’t like that we learn nothing of the relationship between bobby and stag, and how they got started together, at least we get back to the diner pretty quickly. Most movies that start out with a scene and then cut away from it to go back in time and show us how they got to that point, don’t come back to the opening scene until either the end of the movie, or sometimes the middle. This film gets back to it pretty fast, and that’s a nice move. So is the fact that the diner fire isn’t even happening on the same day as the robbery, but on the day before. That’s how far in advance these guys think and plan. They want to make sure the diner is shut down on the day when they go into the bank. They also learn a little bit about the area and the cops in town, just from sitting at the table and scoping out the scene. The robbery is kind of cool. These guys start out that morning by going to the local police station, holding the cops at gunpoint, and then locking them all up in a cell. This way they won’t be taking any chances with cops being called or showing up during their robbery. These are the kinds of moves that most bank robbery films don’t think of. The diner the day before. The cops in a jail cell who are sitting around at their police station. The robbery itself goes smoothly, (I love the moment of Denzel Washington, dressed in a scary mask, stopping his robbery to pick up a crying baby and kiss it,) and the boys get a major surprise. Instead of the moderate amount of money they thought would be in the bank, there is a whole ton. Forty million or so. There are going to be a lot of people who want their heads after this one. The two of them drive out to the desert together; get out of the car to look over the money, and then start double-crossing each other. This is where we learn who both of them are, and that stag is Special Forces, working for the us. army. The characters end up going their separate ways, and this is where the movie starts to fall apart. We are maybe thirty minutes in, and it’s all downhill from here. There are three different villains, lots of double crossing and not being able to trust anyone, and some pretty lousy humor. The action and story aren’t very good either. Just like in Safe House, there’s nothing wrong with the action, it just isn’t in any way memorable or special. The story is also similar to that movie with everybody from all different sides trying to kill these two. It gets to the point where the two of them, two guys from different organizations, have to team up and work together, mar. And mars. Smith style. The problem with 2 Guns is that it’s nothing new. This movie is so clichéd that they couldn’t even think of a creative title that would be specific to this movie. This is one of the worst titles I’ve ever heard. The original premise to the graphic novel was to take a team of guys and have them all working for different organizations, with none of them knowing the truth about the others. That got whittled down to two guys, and it’s a real shame, because the original premise about the members of a team sounded a whole lot better than what we ended up with here. I like the actors who were cast to play the villains, not only Olmos, but also Bill Paxton and James Marsden. Still, the movie feels kind of flat and way too much like movies that we’ve seen before. This director made contraband before this movie, and while not a great film, at least that one felt like something a little different. It also had been foster in it, an actor who elevates the level of any film. This movie doesn’t have anyone like Foster, and it also is missing almost all creativity from its plot.